Every summer, thousands of North Carolinians rush to emergency departments with cramping, fainting, and severe dehydration caused by heat illnesses. To combat the number of people getting sick, UNC researchers are improving advice on how to cope with heat. Research by Maggie Kovach, a geography PhD student at UNC, and her advisor Charles Konrad, found that North Carolina’s heat-illness patterns do not fit with the national understanding of heat illnesses, or recommendations on how to avoid getting sick. Current National Weather Service advisories suggest high heat is more dangerous to the young and elderly in cities at extremely high temperatures. Kovach says what she found in North Carolina is different, and it is changing the way we think about heat illnesses. In North Carolina, she says that middle-aged, rural people are at higher risk for getting sick at lower temperatures. In response to her groundbreaking findings, Kovach is in the process of developing a website that will estimate the number of heat-related emergency department visits in North Carolina based on forecasted temperatures. This tool will give local public health officials the data they need to issue accurate advice on how to stay safe in the heat. Heat illnesses include heat syncope, or fainting due to overheating, and heatstroke, when body temperature goes to dangerously high levels. Other illnesses, like diabetes, can also be made worse by high body temperatures. Kovach says most heat-illness research comes from large, northern cities like Chicago that are not relevant to North Carolina’s geography. Because of the urban heat island effect, heat advisories warn that people living in cities are at higher risk for heat illnesses. In North Carolina, however, Kovach’s research shows that rural locations tend to have more cases of heat-related illnesses. 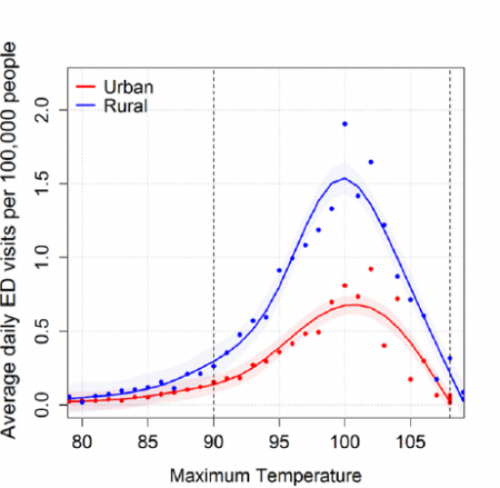 Her research using data from North Carolina revealed that not only are rural communities at far more risk for heat-illnesses, but that unlikely demographics are at high risk too. The National Weather Service says that the elderly and infants are at higher risk for heat-illnesses. However, Kovach discovered that people in the 18 to 44 age range were the ones experiencing heat illness in North Carolina. These were not the only abnormalities she found in North Carolina. 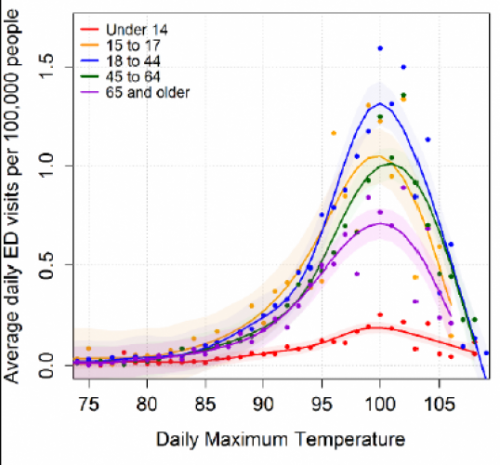 Using temperature data from the respective dates, she found that after the temperature crossed 100 degrees, the number of heat-related emergency department visits declined. Kovach thinks this trend may be because North Carolinians take extra precautions in extremely high temperatures, but not in slightly lower temperatures. Kovach discovered the groundbreaking trends after she charted nearly 14,000 heat illnesses cases between 2007 and 2012 from NC DETECT, an NC program that provides data on hospital emergency department visits from across the state. Kovach says it would be difficult to recreate this research in another state, as getting hands on a comprehensive dataset like NC DETECT’s is almost impossible anywhere else. For Kovach, NC DETECT has allowed her to take her research to the next level. She is creating a website for local public health officials that will predict how many heat-related illnesses North Carolina counties should expect. This summer, Kovach will be having conversations with public health officials about the tool. So far, the program has been developed for Bladen County. Kovach’s goal is to one day predict heat illness in all counties based on the weather. Kovach says this knowledge is important because heat illness can be easily avoided by staying hydrated and cooling down often. There has already been a discussion about changing the National Weather Service’s heat advisories to target younger, more active individuals. In North Carolina, heat advisories could be sent out at lower temperatures more often in rural locations. In the future, Kovach is interested in focusing her research on migrant workers, who have a higher risk of dying from prolonged heat exposure. She hopes to secure funding for thermocons, small devices people can wear all day to collect their body temperature data. Migrant workers in fields, she says, are in particular danger because crop fields tend to have their own hotter microclimate. Some workers also sleep in hot barracks at night. Kovach says this continuous heat exposure can cause problems the following day. 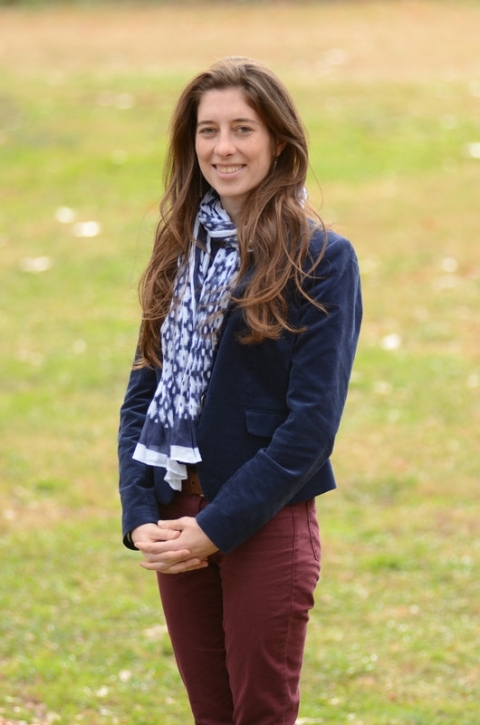 In the fall, Kovach will continue research on climatic patterns on human health at Appalachian State University, where she will be a faculty member. There, she hopes to continue studying heat illnesses, as well as water-borne diseases and vector-borne diseases like Lyme disease. Kovach’s research has reshaped current thought about heat and health, and she says she enjoys using geography to understand topics like heat illness.